You don't get to 3000 contained objects without encountering some unspeakable horrors. Theme: Horror! Your objective as an author in this contest is simple: scare us. Unsettle us, make us paranoid, creep us out. 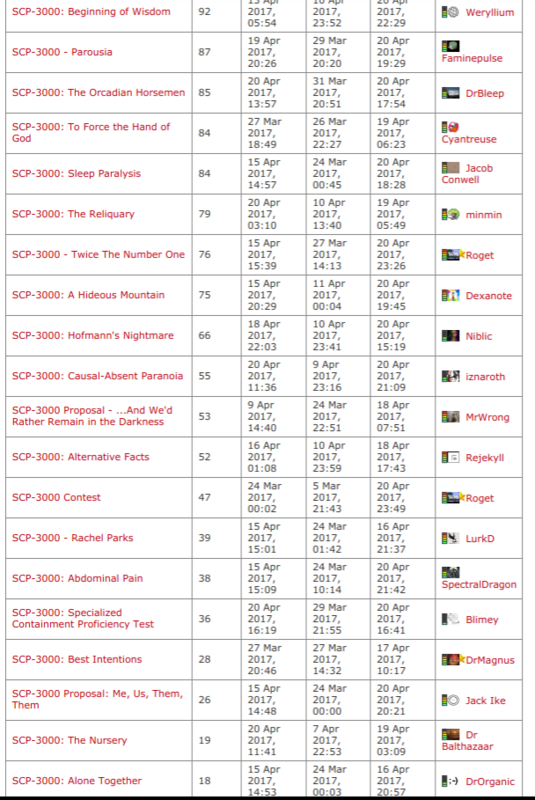 The SCP Foundation's oldest works were intended to bring genuine fright to our readership. This is your aim. You may post your entry in the time slots specified above, though staff may give you permission to post a blank page early. Post in the discussion page if you need accommodations, and a staff member will respond to confirm it. One entry at a time per writer. Writers can collaborate on an entry, but there can be only one entry per author. If you're involved in a contest collaboration, you can't do another collaborative or stand-alone entry. Add the tag "3000" to your entry so it shows up on this page. Once the posting period ends, there will be an additional ten days of voting before the contest is ended. The winner will be declared on April 20th, 2017. Winning: The winner will receive the coveted SCP-3000 spot! The Top Five (that remain in the positives) get first pick of the 3001-3999 numbers. The remainder will be given out first come, first served. This is the only way to get into the 3000 block (SCP Series 4) before it's opened to the general public. The winning entry will be the one with the highest rating at the end of the contest. In the event of the tie, the article with the highest percentage of upvotes will be declared the winner. As children, we might be afraid of the shadows looming from a half-closed closet door or of the monster we believe lies under the bed. Terrors of the imagination run wild at that age. As adults, our fears become more sophisticated, more grounded in worldly events. They become the death of a loved one, the terminal illness of a small child, the fear of our lives running out of our control. Horror, by nature, is a personal touch — an intrusion into our comfort levels. It speaks of the human condition and forcibly reminds us of how little we actually know and understand. Q: Can I write an article with horror elements that isn't trying to be scary? A: The entry must be attempting to frighten and induce anxiety the reader. It doesn't need to be the most terrifying article ever written, but it should be at least somewhat unnerving and leave the reader contemplating what they have read. So, you must try to be scary. Q: Isn't Horror a little broad? A: Most every contest has a relatively broad theme. We don't want to restrict people too much, unless that's the reason for competing. See the Short Works Contest. A: Editing is freely allowed until the posting period ends. You may still make minor edits after that date, nothing that you wouldn't do to someone else's article. Q: Can entries in the negatives be deleted before the contest is up? A: Yes, entries can and will be deleted as normal. Staff will delete any that have been up for 24 hours and have fallen to -10. Staff will intervene in cases of suspicious downvoting. A: You may, so long as you only have one entry. A: That entry would be disqualified from contention for SCP-3000. The author would be allowed to post a different entry. Q: What should I title my page and call the SCP object in my article? 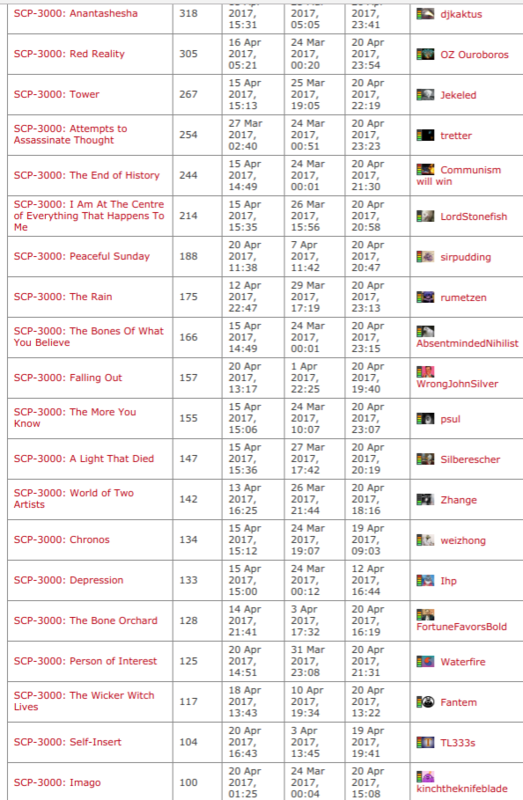 A: The page title can be whatever you would like, it is recommended that you make it similar to your url or just title it "SCP-3000". In the article itself, refer to your object as SCP-3000. After the contest is over, you will be able to select a Series 4 slot depending on how well you do.